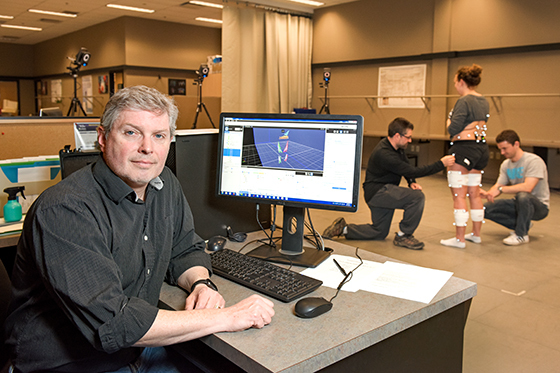 By Dale Johnson Posted: May 8, 2017 6:00 a.m.
A researcher at the University of Regina is looking into whether there is a relationship between the consistency of how a person walks – called gait variability – and the progression of multiple sclerosis (MS), a disease that damages nerve cells and can lead to vision problems, muscle weakness, and mobility impairments. Saskatchewan has one of the highest rates of MS.
Gait variability refers to the small differences in strides while walking. “For example, the time between strides changes based on numerous factors – including your balance and the surface you’re walking on – and is never exactly the same. This research project will look at the variability of stride patterns in individuals with multiple sclerosis,” explains Dr. John Barden, an associate professor in the Faculty of Kinesiology and Health Studies. He says this research is important because assessing and monitoring gait variability may lead to improved treatment outcomes. “We hope that the research will result in the further development of a smartphone assessment device that both patients and clinicians can use to monitor and track the progression of the disease. We also hope that it will result in improved treatment through increased monitoring of movement (walking) that will lead to a decreased risk of negative outcomes such as falls,” Barden says. Funding of $46,000 is coming from the Saskatchewan Health Research Foundation’s Collaborative Innovation Development grant program, and some of that will be used to support a graduate student to help with the research. Also involved in the research project are: Dr. Hakim Raghig, a neurologist at the Regina-Qu’Appelle Health Region (RQHR) who will assist with participant recruitment; Dr. Jennifer St. Onge, an RQHR research scientist, will help liaise with the MS Society of Saskatchewan; and Dr. David Gerhard, a professor of computer science at the U of R, who will provide support for the GaitDoctor© app (created by Barden and Gerhard) as part of the research. “A few years ago we designed an app for the iPhone to measure gait variability. The phone is clipped to your waist and the sensors in the phone record the motion associated with walking to perform the gait variability assessment,” Barden says. Barden collaborates with colleagues at universities across Canada, including the University of British Columbia and McGill in Montreal, as well as those in other countries, including the National University of Ireland.